But more importantly, I think that they killed him off much too quickly. You have to get to know a villain in order for his death to matter. I think his demise would have been much more satisfying if his story arch had been carried into The Attack of the Clones. Note: this pattern would look better with a different background color, but I decided to stick to each character’s lightsaber color for the background to keep everything consistent. So feel free to change it! As you noticed, we are now back to our normally scheduled pixel Mondays. We are done with The Force Awakens patterns, and will now focus on the oldies but goodies for a while. 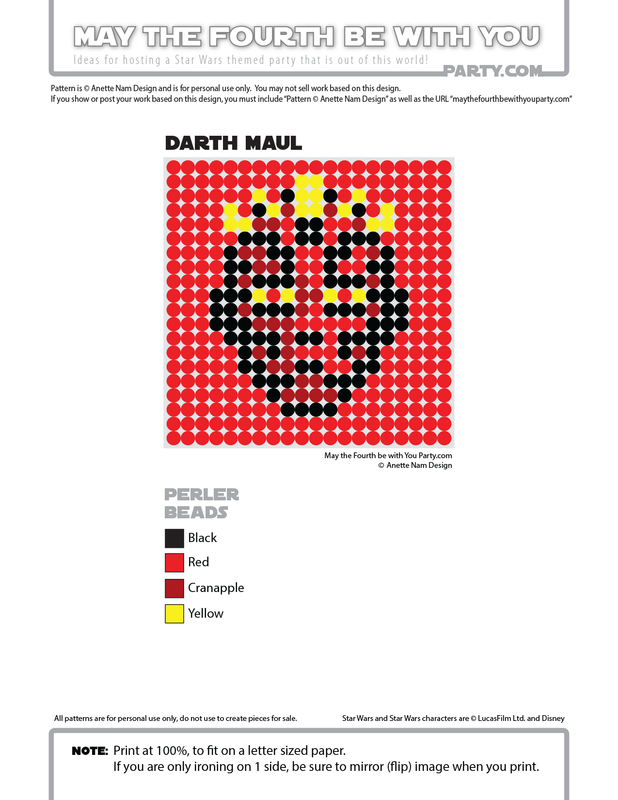 So here #49 in the Perler bead/cross stitch/crochet/knitting/Lego/pixel/mosaic pattern series. I think Darth Maul was more of a pawn used by Sidious to alert the Jedi that the sith were back or maybe he was killed off because he revealed the sith to the jedi (the title “The Phantom Menace” refers to Sidious). Frankly I don’t think Maul was the type to lead armies like Dooku, too feral and secretive. There’s a section in the novel “Darth Plagueis” where Palpatine wonders if Maul is really the right choice in leading the sith forward. Good point! I haven’t read any of the books, but I do agree. I don’t think Darth Maul was meant to be leadership material, more of a “lone gunman.” But to have expanded the vendetta between him and Obi-wan would have been really nice. Most people wanted to see more of Boba Fett, I wanted more Darth Maul! It’s a good thing Maul was brought back in The Clone Wars. It definitely expanded the vendetta he had against Obi-Wan. But by the time of his “invasion” of Mandaloria in the 5th season, I wanted him dead and I was relieved when Sidious ended his reign of terror.